Pic taken prior to departure early April '82 by unit phot LA Fitzpatrick RN in Stromness. On the left is RFA Capt Barry Dickinson then Lt Col Andrew Whitehead RM, CO of 45 Cdo RM. 6th from left in boiler suit looks like Mike Partington Deck Cadet. 9th from left 'VBRS' - Vernon Ramsey-Smith Second Officer. Possibly also Bernard Mennell <TBC>. 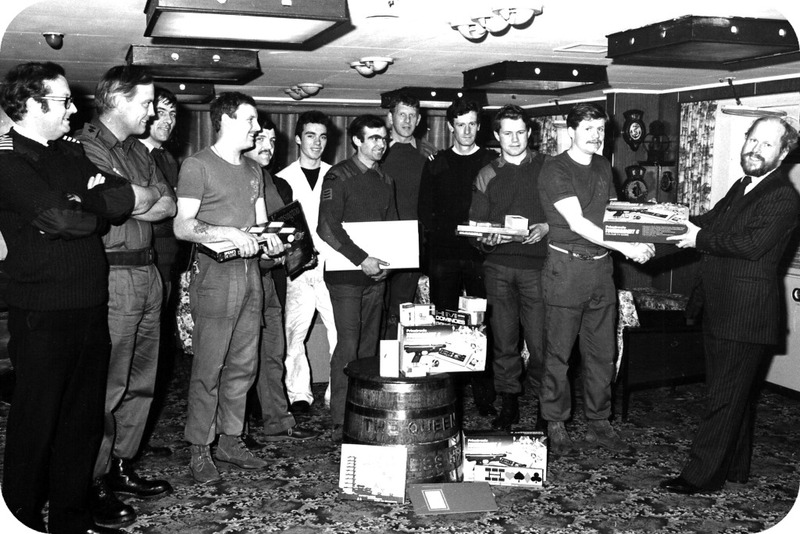 Photo shows RAS(Toys) of a large number of games, videos, VCR's etc to the embarked force following a collection by the dockyard workers at Pompey. Presented by Peter Bryant STO(N). Very gratefully received and fully utilised over the next couple of months. Pic. shared with RFANostalgia by 45CdoRm Falklands War Photo Collection via Clive Pattle. Tnx to Alastair MacFarlane for suggesting some of the names.